I just chance upon this interesting article and decided to take a picture. Some wise words from bill gates. 3. 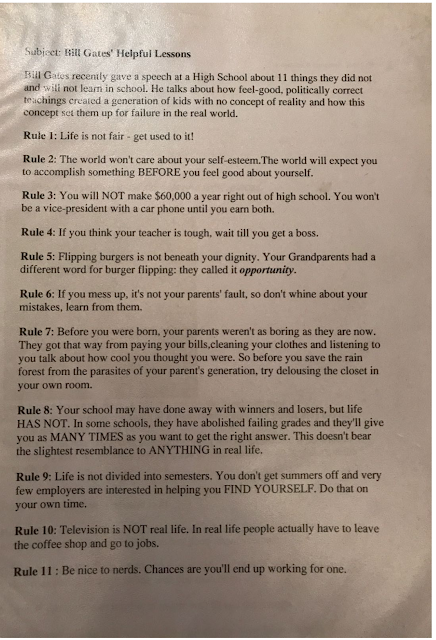 You will not make $60,000 a year out of high school. You won’t be a vice president with carphone until you earn both. 5. Flipping burgers is not beneath your dignity. Your grandparents had a different word for flipping, they call it opportunity. 8. Your school may have done away with winners and losers but life has not. In some schools, they have abolished failing grade and they give you as many times as you want to get the right answer. This doesn’t bear the slightest resemblance to anything to real life. 9. Life is not divided into semesters. You don’t get summers off and very few employers are interested in helping you find yourself. Do that on your own time.